India continues to struggle with providing basic healthcare for its fellow citizens even after decades of rapid economic growth. Accessibility and disparity still are the primary reasons behind the misery. It won’t require an epidemic for the public health system to crumble. The situation is worse in rural and suburban areas. India’s Infant Mortality Rate (IMR), an important health indicator, remains three times higher than China’s and almost six times higher than that of U.S. and Russia, Maternal Mortality Ratio (MMR) more than twelve times higher than that of U.S., U.K. or China. challenges we need to address include dealing with the uneven ratio of qualified doctors to patients, making doctors more proficient at their tasks, delivering personalized healthcare and high-quality healthcare to rural areas. A plausible way to tackle the needs of the plenty and the services of the few is to seek innovative solutions leveraging the power of machine intelligence and human-machine collaboration. Acute shortage of professional doctors and nurses especially in rural areas of India often forces people to consult quacks. 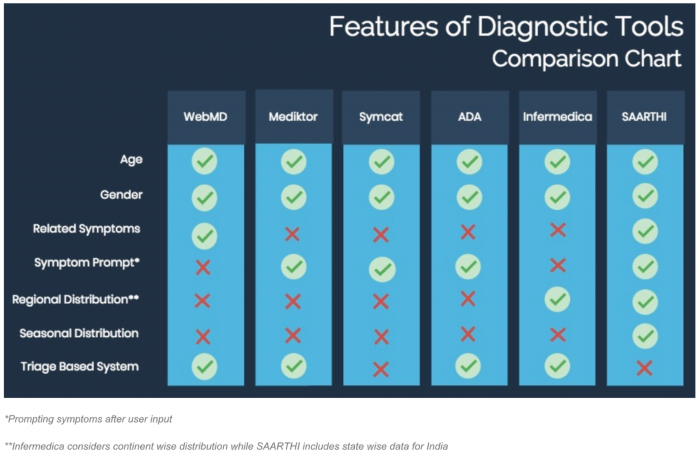 A differential diagnostics tool like SAARTHI can help those patients make better decisions prior to consulting doctors. With additional emphasis on common and highly infectious diseases in rural areas, SAARTHI will be able to identify those diseases earlier with better accuracy. probable diseases prompted by our tool via triage based approach. Along the way, enabling SAARTHI to learn actively and provide more reliable and efficient automated detection of diseases. An App(le) a Day, Keeps the Doctor Away? Through the use of technology and scientifically proven information about health-data, the general population would be more likely to gain access to clinical services and care. The end users of the application can be either the common man or a healthcare provider. SAARTHI will essentially help patients by optimising frequency of visits to doctors in terms of relevance. Furthermore, patients who while seeking appointments are often confused about which department to visit can decide for themselves using SAARTHI which can guide them to the right healthcare professional via potential diagnosis. Doctors, despite their plethora of experience, might enrich their decision-making ability from an automated tool like SAARTHI supplementing their knowledge and recommending better treatments for patients. It also might inspire the doctor to better rule out alternate diagnosis apart from the obvious ones. According to a paper published in JAMA Internal Medicine, physician diagnostic errors are as high as about 15 percent. With that in mind, we can propose SAARTHI as a tool augmenting physician capability with machine intelligence to close this gap. AI-enabled diagnosis can potentially aid even less competent people in making difficult decisions. Also consulting highly professional doctors only when confidence level of such automated tools are low will help in utilizing their skills in more intricate cases. Although it will be a slow process for an emerging country like India, all in all, the inclusion of AI-based solutions in day-to-day medical decision making will eventually enhance patient healthcare in an affordable and accessible manner.